In order to highlight these points, we will examine the viewpoints of the teacher, the principal and most importantly, the student. 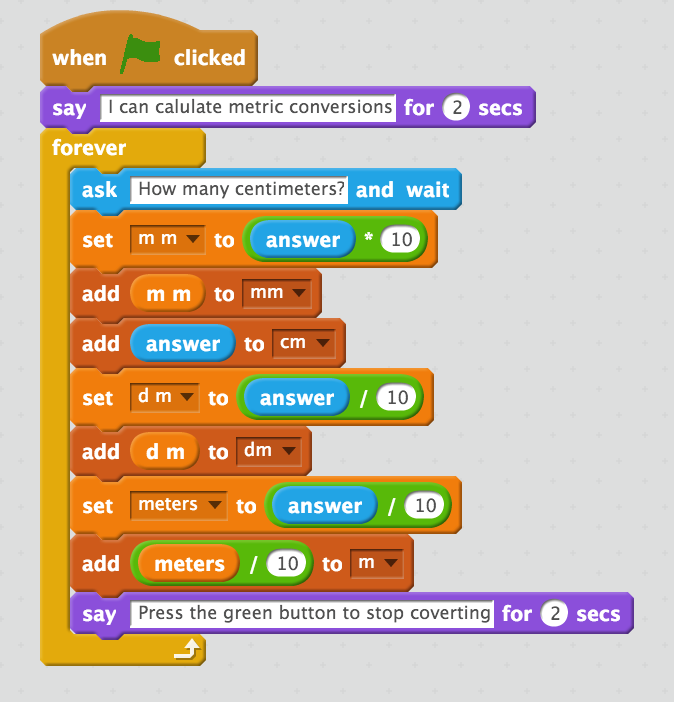 The students for this lesson include Helena and Ailish who are in grade 6 and who have coded for a few months. During the lesson, Ms Kelly Rizzo, the school principal, provided feedback that influenced the direction of the task in a motivational way. If coding is truly important for students, we have to gather the thoughts of various participants. As an extension of thinking processes, I referred to the Ontario curriculum’s achievement chart. In particular, students have to look back at their solutions so that they can make changes towards a desired outcome. The achievement chart likely refers to mathematical solutions, but coding meets and enriches these criteria. When presenting a coding task, there is a subtlety to introducing a few coding blocks. In so doing, students build their coding skills for future tasks and programming languages. At the same time, discovery is important. It is not necessary to apply direct teaching of these blocks, relying instead on student need or differentiated instruction. “This program was not difficult because I have been using Scratch for some time. Our teacher taught us that you have to multiply and divide to convert. I took what I learned and made the number [variable] divide by 10 or multiply by 10.” – Helena, Student. As was explained to the students, programmers usually make improvements to their program according to feedback from users. The principal’s contribution provided extra motivation to meet the challenge. The group went back to their Scratch programs. 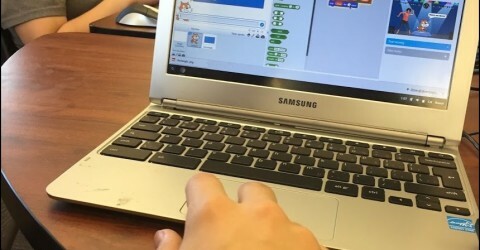 Both students decided to create a new Scratch program even though they were provided with the option of altering their existing basic codes. As their teacher, I also knew that their codes would be considerably longer, requiring more thinking, collaboration and math application. “This code was more challenging”, explained Ailish, “You have to create the program so that it does not convert the wrong unit. 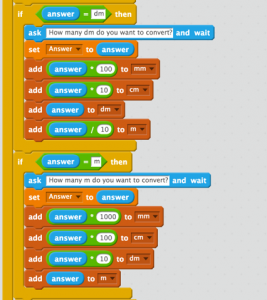 My previous code helped because I could copy what I did.” In looking at the above code, it is apparent that the student had to apply more conversions. When Ailish explained her thinking, I realized that the initial step of converting from only centimetres was essential so that students can work towards a more elaborate plan. As students progress in their math, I find ways to incorporate coding once again. These students will be learning multiplication and division next, which prompts me to think of coding ideas with computer science tie-ins. Maybe I will teach them to code a division calculator which requires floor and ceiling functions. 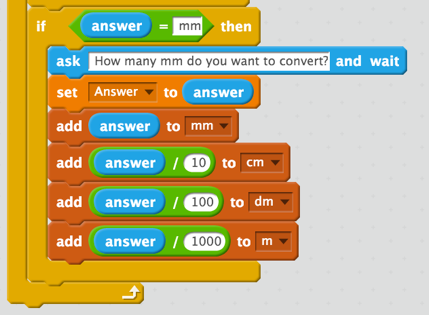 Maybe we can incorporate more blocks so that they construct a program that finds factors. To find factors, they could incorporate another list block feature into their codes. 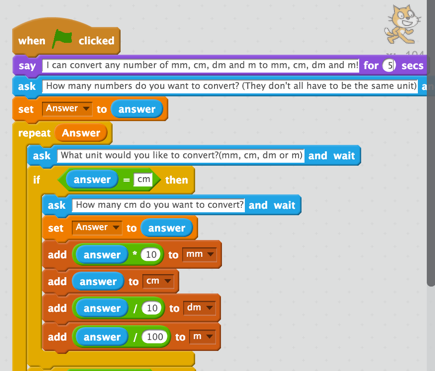 By adding more blocks, they are learning sophisticated coding functions using a kid-friendly programming language. In terms of reflection, a model for a coding lesson structure emerges. This format starts with an attainable entry point and progresses in difficulty. Along the way, the lesson relies on student feedback and collaborative thinking. Motivation and growth mindset are all embedded in this type of instruction. *** I would like to extend my gratitude to Ailish, Helena and their families for allowing me to include their wonderful ideas into this writing. Thank you also to Ms Kelly Rizzo, our School Principal. Their contribution definitely brings much added value to this piece!